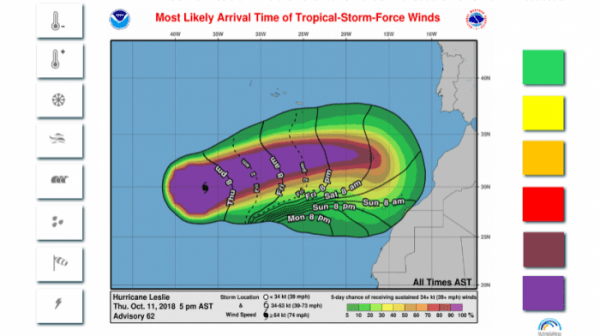 In a statement, the Portuguese Institute of the Sea and Atmosphere (IPMA) leaves alert to the archipelago, due to the arrival of hurricane Leslie. “The center of Hurricane LESLEI was located 1868 km west-southwest (WSW) on the island of Madeira. Hurricane LESLEI is moving east-northeast (ENE) at 35 km / According to the forecast, it is very probable (70 to 90% probability) that the Madeira and Porto Santo islands will begin to suffer their effects, starting at 09:00 CET (10:00 AM from Madeira). Saturday, the 13th. In these conditions, from the afternoon of Saturday, strong wind is expected from the south quadrant with bursts up to 90 km / h gradually turning to the northwest (NW) and in the mountainous regions the wind will be STRONG to VERY STRONG with gusts up to 110 km / h.
An increase in sea agitation is expected with waves of 5 to 7 meters of significant height and 10 to 12 meters of maximum height of the west quadrant (W) “. Strong wind, precipitation and thunderstorm are expected.